I have a feeling that nothing has changed between my years in high school and now… braces still aren’t cool. Not only do they not look cool, my mouth hurts just thinking about them even 15 years later! Did you know that your kids could forgo all the pain and torture you went through?? Invisalign Teen effectively straightens teeth without “brace face”, so your child can shine their bright smile without anyone being aware they’re on. Since they’re removable, Invisalign Teen is perfect for your active child. They won’t interfere with sports, music or other activities. Invisalign Teen works by using removable aligners to gradually straighten teeth. I don’t know about you, but when I had braces, it was a whole production just to floss my teeth every day. 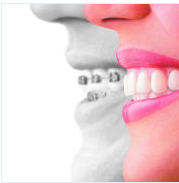 Invisalign Teen makes maintaining good oral hygiene much easier. There aren’t even any forbidden foods – your child can have all of the popcorn and bubble gum they want! Well, maybe not, but they still can have it on occasion. Even better, it costs about the same as normal braces, so it’s good on your wallet. You want your child to show up to school confident, and when they look good, they feel more confident!! One Southern Savers Reader will win a $100 Target Gift Card from Win Giveaways, sponsored by Invisalign Teen, to get started on your back to school shopping. 1. Comment: Tell me in a comment below what part of Invisalign Teen you would have loved the most (or do love if you used them). 3. Follow: Invisalign and Southern Savers on FACEBOOK, or DAILY EMAIL and leave a comment below that you are. This giveaway is sponsored by Invisalign. I received products to review, but all opinions above are 100% my own.